Having drafted its image benevolent in covering every spinal condition on the global platform, Spine Surgery India gets itself an axis to the world-class facilitation for spinal treatments and surgeries in India. Known as the foremost name among the spinal medical addresses globally, the company is meant to leaving its footmarks noteworthy when to look on getting your spine so as you were born with. Here, disc bulge, one of spinal disorders, presents itself a common spine injury sustained to your spine’s intervertebral disc. In addition, it can occur in your lumbar spine, thoracic spine or your cervical spine. The degree of spinal disc injury differs significantly from mild disc strains, mild-moderate-severe disc bulges through total disc rupture of the nucleus. At Spine Surgery India, disc bulge treatment in India adds itself one of reliable spinal solutions that helps in treating to the cause of lower back pain. X-ray: X-ray does a relatively inexpensive role in confirming the doubt to the attendance of a herniated disc. If a doubt gets thus stronger, the other methods may be used to offer the final confirmation. Computed tomography scan: It can show shape and size of spinal canal, its contents and the structures around it, such as soft tissues. However, the visual confirmation of a disc herniation could be difficult with a CT. Magnetic resonance imaging: It can show the spinal cord, nerve roots, and surrounding areas, as well as enlargement, degeneration, and tumors. It explains the soft tissues even better than CAT scans. An MRI done with a high magnetic field strength usually offers the most conclusive evidence for diagnosis of a disc herniation. Myelogram: Myelogram still offers the excellent outlines of space-occupying lesions, especially when combined with CT scanning. Electromyogram and Nerve conduction studies: These tests determine the electrical impulse along nerve roots, peripheral nerves, and muscle tissue. This is to indicate whether there is ongoing nerve damage, if the nerves are in a state of healing from a past injury. These studies are typically used to identify the sources of nerve dysfunction distal to the spine. Unfortunately, the bulging disc injuries are usually not a quick fix. 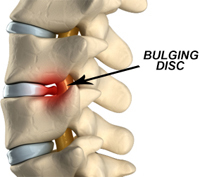 Most bulging disc injuries take to the several weeks to resolve. Also they will remain weak and vulnerable for at least six weeks, or the sometimes longer. However, the good news is that the most bulging disc injuries will not remain painful for that time period, but some do and these tend to be the disc injuries that are badly run in the early phase.